We both loved Lynn, the Red Mustang. It was a fantastic day and great way to experience a car you love but will probably never buy! Great to drive and lots of people stopping and staring!! Many thanks. Caroline June 2017. Had a great day with Loretta the weather was perfect and so was Loretta. She was easy to pick up and return Terry and his wife are a delightful. My teenage girls loved the day with the top down touring the vineyards. Susan Apr 2017. We had a great experience with Blanche. Beautiful car! Tom Apr 2017. Really enjoyed lynn. No complaints and would do it again for a special occasion. Brian Apr 2017. Windsor was fantastic! Not a single issue! Wouldn’t mind having him at home! Peter. Apr 2017. It was a fantastic day. Lynn looked pristine when I picked it up. The weather was a bit overcast so we thought it best to keep the roof on. I was initially nervous about driving a car like that (it was the first V8 that I have driven!). Again a great day and thanks to all. Damian Apr 2017. We had the most tremendous day yesterday in Fins, my husband said it was the best birthday present ever and SO much more of an experience than he expected. Totally worth waiting for awesome weather. Paul was great. Belinda Apr 2017. We certainly enjoyed taking Miss Daisy for a spin. Great car, great contact, great day! Thanks again! It was an easy process and I would recommend it further. Fabian Mar 2017. Being able to drive Rocky not only fulfilled a life long dream but reignited my desire to own my own classic Mustang. Rocky ran like a charm all day and roared when asked without hesitation. Thank you for allowing me to spend the day with Rocky. Daniel Mar 2017. The day went exceptionally well. We were very pleased with the service provided for our daughter’s special day, and particularly the quiet drive home late at night after the wedding. Alfred didn’t miss a beat, all good. Graham Mar 2017. Thank you for bringing your beautiful Sophia into the city and making the day for my young nephew and his grandmother! Thank you also for elevating me to the lofty status of favourite uncle! Darren Mar 2017. Hiring Black Mamba was a (significant) birthday present for my wife and she had a smile on her face all day. The car ran well and was a lot of fun. Stuart. Feb 2017. Black Mamba was a brilliant car; great sound; perfect day; we both loved every second of it. Iconic car. One little boy pointed at it and said “Mustang!” (At a roundabout near you) that put a big smile on my face, no-one has ever pointed at me and exclaimed “Toyota!” 51 years old, one speed wipers, no demister , roof leaked a bit; who cares! It was a memorable experience for us both, thank you for that. David Feb 2017. Yes had a great time with Hank , really enjoyed the few days we had. Definitely do it again , thanks. Robert. Feb 2017. A huge thanks. Stella was a wonderful surprise for hubby for his birthday and everyone loved the outing. My Dad (aged 78) and Mum (70) was visiting with us in Gold Coast and they absolutely loved the experience as did our teenage children. 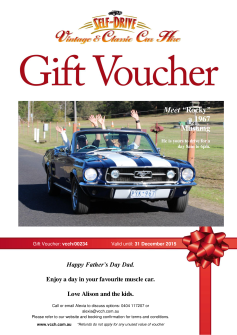 The weather was perfect and we drove to Byron Bay and shared seats in the Mustang at different times with the family. I enjoyed driving our SUV behind and watching them enjoy themselves. We enjoyed breakfast at Three Blue Ducks and to the beach and shops in Byron. Everyone was a little sunburnt but it was worth it! Susie Jan 2016. Thanks to my Two Sons and Two Daughters and Step Son Scott For wonderful 70th Birthday present of driving Windsor The Red Convertible for the day .Unfortunately I was not able to drive Windsor my self But i took pride of Place in the Passenger seat and our whole family came along In a following Car taking turns at be a Passenger in this Wonderful Vintage Car in Immaculate Condition we even giving Windsor a chamois of the Body With loving Care. Thanks for such a wonderful Dream come true for me to Drive a Mustang. Terry Jan 2017. We had a great day with Penelope. She behaved impeccably. The weather was perfect, and even though it was a hot day she showed no sign of overheating. We have a fantastic trip through the Royal National Park and over the Sea Cliff bridge. We will definitely be back for more. Richard Jan 2017. Just to show you how much we loved Angelika I have attached some very special photos. John was also very good to deal with. He was just as passionate about our day being special as he is about his car. Nick was also very responsive in regards to arranging the booking. Overall, a great experience. Chris Jan 2017. I had an absolute ball of a time with Roger. 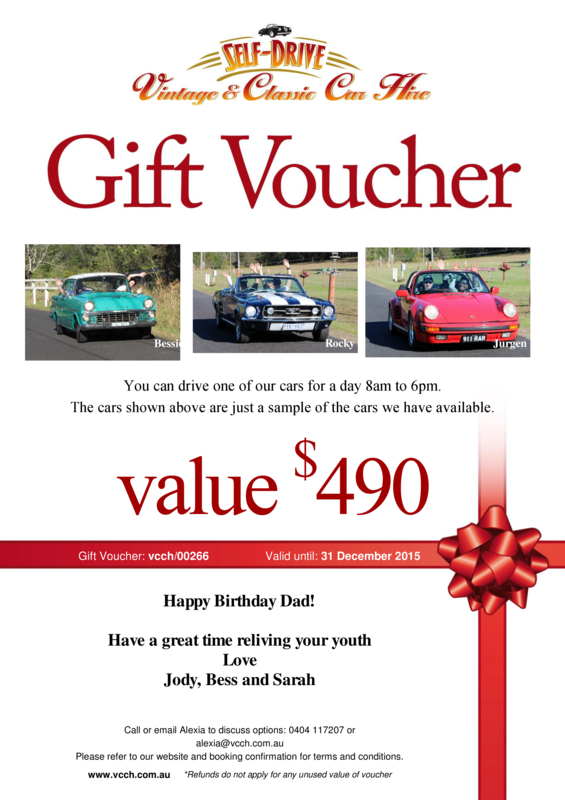 We had a family convertible picnic day in Kiama, traveling down via the sea cliff and with my daughter following in convoy in her 2005 VW Beetle convertible – Roger performed spectacularly going down the coast and then back home via Kangaroo Valley. I also had a fantastic trip up to Wiseman’s Ferry with my wife on Sunday – the road to St Albans over the ferry was a spectacular place to experience driving Roger. Terry was also a pleasure to deal with – he had Roger immaculately prepared, and thoroughly explained everything about the car. All in all I’m very happy with my experience in hiring Roger, everything went really smoothly and it’s a weekend I’m sure I’ll still be smiling about for months to come. Michael Jan 2017. Rocky was excellent, a great day thoroughly enjoyed ourselves, thanks very much for the experience. Volker Jan 2017. My wife and I had a lovely day in Goldie. The car ran faultlessly and the owners were very nice and explained all about the car. We would recommend this service to anyone. Karl. Jan 2017. Our day was most enjoyable and Roger performed admirable. It was a great experience and brought back many fond memories of motoring with the hood down. May take up an opportunity in the future to try another of your classics. Tony Jan 2017. Yesterday’s joyride was fantastic, my partner absolutely loved the surprise! And George was such a wonderful driver and we highly recommend him. Thank you so much for organising it all for me. Will definitely be using your company again if we ever need another car hire. Catherine Jan 2017. I can only say the day with Penelope was fantastic. John really enjoyed driving the car. As an experience, we are still talking about it and the photos are being shown around. I think we have stirred peoples interest in the concept. So maybe we can get you a few referrals in the future. Cheers Jane. Dec 2016. Had a great day out with Bertie. My wife and I drove through the National park and onto Wollongong for lunch. It was a great day, highly recommended. The car performed exceptionally well and did not misbehave at all. I would recommend the day out on the road for anyone looking for a different style of fun. Robert. Dec 2016. What a fantastic time we had with Sophia. Thank you so much for making your precious Ferrari available for the weekend. Its one of those things I have always wanted to do …. just drive and enjoy a classic Ferrari with the top down. So much fun and the whole family could fit, they loved it! Peter Dec 2016. Fins was great, had fun at our golden wedding anniversary and was reluctant to leave us on Sunday morning! Bob. Dec 2016. Was an awesome experience having Penelope for the weekend and as a part of our wedding. I will definitely be taking her again soon. Thanks for everything! Andrew Dec 2016. My wife and I had a great time in Roger thanks. Matt Dec 2016. We had a wonderful day with Blanche! Took her down to Palm Beach for breaky, Clareville for a swim and visited our brothers at work so they could check her out too 🙂 We absolutely adored her and hope one day we can have a Blanche of our own!!! Daniel and Holly. Dec 2016. 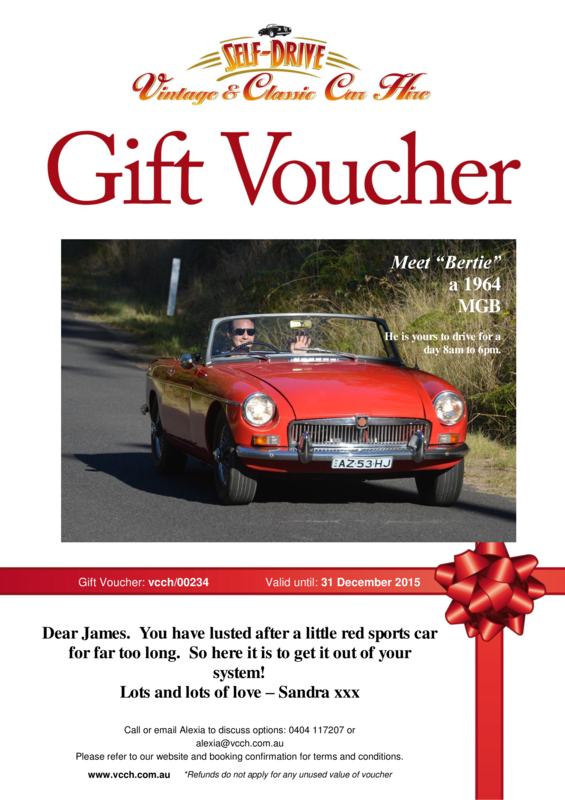 My husband was thrilled with his surprise MGB birthday. Spending the day with Bertie with the wind in our hair, zipping along the gorgeous south coast “living the dream” … it was just perfect. Bertie behaved himself beautifully & I can understand why… because he has been lovingly cared for by Peter. Thanks for a great day! Christine Dec 2016. Yes Fangit was amazing ! The owner ,Paul went out of his way making suggestions of where to visit, gave us maps , a detailed description and history of the car ,even two of his caps to wear! He was extremely obliging and gladly handed over his keys to his prized possession for the day without any limitations( of course we were respectful and abided to the law ). I would have no hesitation in recommending or hiring again ! Tom Dec 2016. Laura and I just wanted to thank you for the beautiful cars. Having Penelope was so special and was the perfect car for our wedding theme. Thanks again mate! We will definitely be seeing you again soon for one of your beautiful cars. Andrew and Laura. Dec 2016. We had such a great time as expected. The boys loved Rocky. I’m sure they were wishing they were in my seat! We’ll be back! Anna. Dec 2016. Windsor was a treat to take out. Everything went smoothly this time and there were no problems whatsoever. My girlfriend and I took him out for a nice run up to Wisemans ferry and the surrounds. I really appreciate how helpful Nick and yourself were in accommodating and organising rescheduled dates for the different Mustangs. Ryan Nov 2016. Driving Rocky was an amazing experience. One of the best nights to drive with the top down. We both had an amazing night and would definitely recommend it friends and even do it again myself. Fraser Nov 2016. Yes we had a great day with Sally. It was a dry day but great regardless. Car was fine.The owner was a good guy also! Allan Nov 2016. We had such an incredible day with Stella! It was a dream of my dad’s to drive a mustang for many years now and he was very excited when we surprised him with it. We drove down country roads and then stopped for lunch and headed back along the beach. It was a gorgeous day so that made it even better. We thoroughly enjoyed the whole experience. No troubles booking on the day we preferred and it was very last minute. Everyone was very professional and helpful. Thank you very much, Katrina Nov 2016. Thanks Keith very happy with FINS. Ben Nov 2016. We were very happy with Rocky and the way things went. Thankyou again for a great experience. Bernadette Nov 2016. Hi Keith, yes Black Mamba was a bit of fun!, we enjoyed the day. Thanks for the follow up, Pete Nov 2016. We really had a great day and I enjoyed driving the car very much! Rocky looks and sounds great. The process, pick up and return were all straightforward and friendly! Thanks. Stuart Nov 2016. We had an amazing day out with Bartholomew. I hired him as a surprise gift for my partners 30th and he loved it! We went for a nice drive down through the Royal National Park and had lunch at the Stanwell Park on the beach watching the hang gliders. It was a beautiful, relaxing day. Your team made the whole planning very easy and the owner was extremely helpful in organising pickups & drop offs. Everyone who has asked me about the car I have recommended your site to. Natasha Oct 2016. The car went down a treat! We had a lot of fun driving her and Matilda made a man’s dreams come true, and I must say there has been a lot of research into purchasing one of our own! Many thanks again. Caitlin and Andrew Oct 2016. We had a great day out with Rocky. My husband Chris really enjoyed taking him for a spin. Kristy Oct 2016. Johnnie was used for our wedding and close family friend of ours him. He had a ball being able to drive and bring the bridesmaids in. Many thanks. Josh. Oct 2016. My mother and I had a great day out with Rocky. He was extremely well behaved! Courtney Oct 2016. We absolutely loved Black Mamba and looking forward to the next run. Holly Oct 2016. We loved Shelley & will defiantly rebook her again as we had no issues with the car or the booking with you. Karen Sept 2016. All went very well and we were very happy with Bessie for our wedding – and Phil for driving! Tom Sept 2016. We loved Penelope!!! Wish we could own her in fact. One of the greatest things about driving such a car is that you’re actually driving! Needing to check dials, listen to her and understand her ‘preferences’ as it were, made the day all that more special. Thanks again for loving such a wonderful old car! And allowing us to spend the day with her!! Richard Sept 2016. Hiring Rocky was a highlight of my wife’s Birthday weekend. Everything went well and as expected. We had to remind ourselves that hiring a car of 49 years would have some very different controls and quirks. It was a lot of fun driving Rocky and getting all the attention in the suburbs, the highways or even parked on the road whilst having a coffee. Definitely will look into hiring Rocky again, or possibly acquiring our own (should II somehow convince Renee of that!). Peter Sept 2016. We absolutely loved Rocky!! It was dad’s fathers day present and he was so happy!!!!! Amanda Sept 2016. Thanks very much for the opportunity to take Rocky out. What a great car, I’m not sure if Josie realises what she has started by getting me behind the wheel of such a nice piece of machinery. Ben Sept 2016. The day with Henry was excellent, a beautiful wedding and made even more special through the ability for us to have Emelia’s uncle and godfather drive her there. Chris Sept 2016. My partner Ian and I had a great time with Hank… though I think Ian wasn’t too impressed with my handling… !! Driving Hank reminded me of walking a big, badly trained dog… straining at the leash… he just wanted to run and run, but we had to hold him back!! The day went well, and we had many admiring looks. Amanda. Sept 2016. Bertie was great. Full of character. A nice easy drive. David Sept 2016. I just wanted to thank you so much for the experience with Penelope! Rick loved it and she has left an indelible mark on his heart! Will sing your praises far and wide. Kristin. Sept 2016. Bessie was absolutely wonderful! She’s a beautiful car and very well maintained. She added the touch of nostalgia and class we wanted for our wedding. It was so special for me to have an EK and they’re very hard to find in such good condition. Cathy. Aug 2016. I had a great day. Perfect weather, drove her up the old pacific highway. Blanche was very well behaved Thanks for setting it all up. Tom Aug 2016. The Cobra was AWESOME!!! It was probably the most fun I have had with my clothes on. He behaved himself immaculately and he is a real head turner. Great to drive and we certainly took him for a good run. I will most certainly doing it again and have passed your details onto a couple of mates who are interested in taking a car out. Thanks to you and all the team. Damien Aug 2016. My wife enjoyed having Lynn for the day, our son actually drove as it may have been a bit tight for the wife to get behind the wheel. I rode in the back with our daughter in law, and we all enjoyed touring the vineyards with the top down. All in all, a most pleasant day, with our son planning to hire the blue Mustang when his wife’s brother and his wife visit from the UK in 12 mths time. Clive Aug 2016. We had a fantastic day in Penelope! Jacqui Aug 2016.. It was a great couple of days in Windsor, such a beautiful ride – no complaints. Fantastic time. Thanks mate. Michael. July 2016. I absolutely loved having Bessie for the weekend! What an amazing car. It drove perfectly and turned heads everywhere I went. I didn’t want to give it back. Phil, the owner was a pleasure to deal with and a genuine nice guy. Thanks so much. Justin July 2016. Had a fabulous time, Matilda was perfect and the day was exactly what I had hoped for – my partner was stoked! Nicola July 2016. We had an awesome day with Windsor thank you. Mick, the owner of the car, was very friendly and easy going which was great. The car itself was very cool. We had a great time! Sheridan July 2016. Rocky did perform very well, no hic-ups. t did bring back memories of some of the cars I used to work on! Colin July 2016. All went well with Bertie. They loved the surprise, the trip became more about the journey than the destination Ron said, so thanks to your efforts above and beyond they had a great time. So thanks for that. It got them all over the countryside and back. I will definitely be back in touch for future ‘events’. Alex June 2016. My dad truly enjoyed the drive in Roger. Said it brought back a lot of memories of the one he had when he was younger. Thanks again. Michele. June 2016. It was a great couple of days, Windsor was such a beautiful ride – no complaints. Fantastic time. Michael. June 2016. Our time with Rocky was absolutely great. So good to drive a classic car as it was back then. He is such a cruising car with the top down on a beautiful sunny day as we had, it was absolutely unforgettable. A fantastic experience that both my wife & I have been raving about to family & friends. I’ve been passing on your website to everyone that has asked also. Tony. May 2016. I think Shelley was more admired than the bride! Our experience was very good and my son was one happy boy. Thank you once again. Bernadette. May 2016. From the collection and drop back you Penelope herself, both you and her surpassed my expectations. Thanks for a lovely weekend! Darren April 2016. We had a great time with Bartholomew. This was a surprise for my wife’s birthday and she was very surprised and had a fantastic time! This may have back fired as now she is talking about buying one! However it did do a great job of making our friends and family very jealous with the pics we took on what turned out to be an amazing day for a drive! We still talk about Bartholomew now a month later. What a great adventure, well worth it! Sean April 2016. The Windsor was great. We had a really fabulous time and my husband Peter really enjoyed driving his “dream car” for his 60th birthday . Instructions were good and he behaved himself impeccably. Would recommend Windsor to others. Donna April 2016. We had a great time with Penelope for the day, she behaved very well and was a pleasure to drive. It’s a really great feeling to actually have to drive a car – we are so spoilt for comfort in cars these days I had forgotten what it’s like to have to put some muscle and concentration into driving! Will. April 206. Rocky was an absolute pleasure to drive and behaved very well. He was a dream to cruise around in. Loved the noise and throb and my sons enjoyed the fun of cruising with the top down. Look forward to next time. Barry April 2016. My dad had a blast in Bartholomew. Was an awesome surprise! Dru April 2016. We thoroughly enjoyed the few days we had Penelope, at 2,500rpm it makes the best sound ever. My English neighbours (who are in their late 70s) came around and couldn’t stop admiring it, so I had to take them for a short drive and they absolutely loved it. It`s one of those cars that makes even the youth of today turn their heads in admiration. A terrific birthday present for Sharna who loved the whole experience . If you decide to sell please contact us! Kevin April 2016. It was loads of fun taking Rocky for a lovely drive up to the mountains. He is fun to drive and certainly has many well feds horses under the bonnet! He certainly turned a few heads and the three of us have appeared in many of the Asian tourists photo albums! A wonderful experience that my other half had given me for a Chrissy present. Also thank you for being so flexible with the dates for hire. I wish you all the best with Rocky and your lovely cars. Sam April 2016. Rosie was perfect, thank you very much. We will send through a few pictures once we get them. Matt April 2016. I enjoyed the experience with Penelope and we had a nice day driving her around. I would like to do it again some time. Adrian. April 2016. What a great joy ride! Keith and his Ferrari met all our expectations. It was an hour of fun packed driving down through the Royal National Park. Definitely recommended and not for the faint hearted. Absolutely brilliant experience. Ildo. April 2016. Thank you very much for the lovely motor Penelope. This was a fantastic birthday present. Happy Travels. Sharna & Kevin. April 2016. My wife and I had a great day out in Rocky, cruising with the top down in a convertible was a first for us both, and a nice sunny day was a bonus. We had heaps of people staring, waving and several compliments from people pulling up alongside. I found it easy to drive and enjoyed the V8 rumble from the exhaust…very nice. All in all….a really good day. Graham March 2016. We had a great day and Sven behaved very well. I will send through a photo or two of Sven in all his glory from the day. Many thanks again to you for the service. Jason and Pam. March 2016. Yes Henry was a perfect gentleman! We enjoyed our trip with him and our driver had a fantastic time too. The flowers were a nice touch! Craig and Fiona. March 2016. My husband had a fantastic day with Penelope. I think I have competition! Patricia March 2016. Everything went smoothly for our wedding. The Mustangs and Camaro were great as were the drivers. Thank you. Michael and Anna March 2016. The Mark V Jaguar – Bonnie – was wonderful and the bride was thrilled. The service was outstanding. The guests took a deal of interest in the car. I witnessed the interest and there have been a number of follow-up remarks. I enjoyed meeting and chatting with the owner. Please pass-on my sincere thanks. I would have no hesitation in recommending the car and VCCH. Mike March 2016. My husband was pleasantly surprised to find out that we had Rocky for the day. We were able to take it to Richmond then along Bells Line of Road to the Darling Causeway and through Leura before picking up the kids from school – who were very excited to be driving in a convertible. We had the top down most of the day until we were close to the Lane Cove exit of the M2 and we pulled over to put the top up. Rocky was great to drive – reminded us of the husband’s old ZD Fairlane – disc brakes and power steering that responded a little on the slow side . Either way it was an exciting ride! I was even allowed to drive it! Pick up and drop off were very easy and as the weather was a little on the iffy side – the owner was very generous to allow us to make the call on the morning of our day. Thanks again for the experience and we will definitely think of you when the next celebration comes around. Patricia March 2016. Hi Keith, Penelope was a dream, thanks again for a great weekend. We followed your advice and went to St Albans, it was great advice! Darren March 2016. Bertie behaved well! We’ll be back for more from your brilliant garage. Pagoda Roof SL is the next preference! Stephen and Vera March 2016. My feedback on what was an enjoyable day. Firstly, Windsor’s owner Mick is a great, friendly bloke. He took us (my young son and I) through everything and showed us all of Windsor’s little behaviours, he even took us on a test run around the block. There wasn’t anything that was of real concern to us. During the day Windsor behaved admirably and put on a good display to the many eyes that followed him down the street. The whole family had a great day, it was the best birthday present I have ever had and will never forget. A huge thank you to Windsor for providing this highlight. Jeff March 2016. Hank photographed nicely alongside the new Mustang. A hassle free experience – which was the main thing we wanted. Kris. March 2016. We had a fantastic time in Rocky thank you very much. Especially our 4 year old boy who thought returning to pick up mum’s car was a complete drag and he wasn’t impressed! Thanks again…you were great and the owner was lovely. Kristen. March 2016. Thank you Keith, Rocky was absolutely fun! Vikas March 2016. Bertie was great. I was surprised how smooth it was off the clutch. I was expecting something rougher. Similarly, I think the brakes were better than they felt, they just needed to be pushed harder to get the reaction. Changes in technology! The briefing was good. Relaxed and a bit tongue in cheek which put me at ease borrowing someone else’s car. We went down through the national park to Wollongong for lunch and back same way. The wife was very impressed. Tick! I’d be happy to recommend it and have done. Ian February 2016. My dad hasn’t stopped talking about the jet flight and the joy ride in the MGA. Colin is a great guy my dad hit it off with him right from the start. Thanks. Kate. February 2016. Everything was perfect with Bonnie, your MK5 Jaguar! Thank you so much! Amanda. February 2016. Oh yes, the boys loved the Ferrari Joy Ride. Ross didn’t stop talking about the experience. 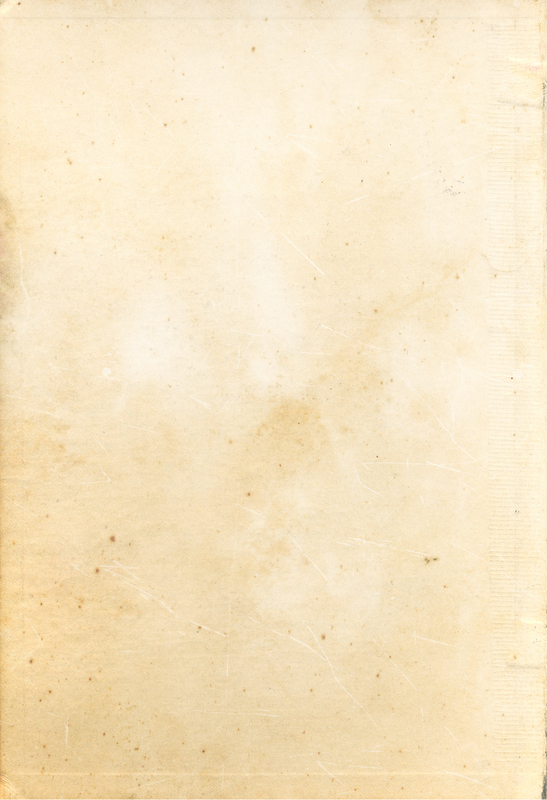 Thank you for everything, I have kept your contact details for any future correspondence. Carmel. February 2016. The Ferrari joy ride in Sophia, was a dream come true. A great experience. This has been on my bucket list to do. Keith look after me and my friends. Lovely drive. Sharon Jan 2016. So sorry for the delay in getting back to you – Fangit was perfect!!!!. We had the best day EVER. Steve literally could not believe it – it certainly was a WOW factor. We are still waiting for our photos. Once we receive then I will forward some on to you. Was definitely worth the price tag . Kerry. January 2016. Thanks for your email. Hank was a big hit for the day! It was a mid twenties sunny day, so the weather was perfect for a drive. Nothing but positives are in order for Hank. Everything ran smoothly, from booking, picking up and driving Hank. I’ll definitely be hiring another vintage vehicle in the near future. Thanks again. Mitch. January 2016. Miriam and I had a very stylish anniversary day cruising the northern beaches and lower north shore in Penelope. She was extremely well behaved with more than enough cheek to give us a thrill and turn plenty of heads. It was also a real pleasure to meet your associate on the day – a very accomplished gent! Mark. January 2016. Yes, it was a great weekend with Lynn. It poured the first day up there in the hunter but cleared up enough to lower the roof after that. The owner’s name escapes me but he and his wife were very helpful and friendly. I will definitely be recommending the experience. We had a blast. Phil. January 2016. It was fantastic. Ann-Maree and her friend had a great time in Winnie. Bob did his upmost to ensure the trip was enjoyed and comfortable. I would definitely use your service again! Marc. January 2016. Just a quick email to say thank you to you and Mark – the owner of Rocky the ’67 Mustang convertible. We had a great time out on Saturday – from Palm Beach to Bobbin Head and up to Brooklyn; the weather was perfect and the car was awesome! Our boys (12 & 10 years old) thoroughly enjoyed the open top experience and the attention the car attracts. I just now need to convince my wife I need a V8 again! 🙂 Brett January 2016. Many thanks for today. Helen absolutely loved Penelope. Colin January 2016. We had a wonderful day in Cleo and Matt absolutely delighted in the car, it was fantastic. Thank you for allowing us to use her in lieu of the Mustang, it allowed me to give Matt a great birthday present and, what’s more, he proposed to me that day! The car made everything just a little more special. Jasmine. December 2015. John had a grin on his face all day. We got about 320kms on her when the rain came. Even with the top up people still keep on looking and we probably enjoyed Shelley more! Mark December 2015. I had a fantastic time with Rocky and the experience was everything I was hoping for. It was the perfect day to have the roof off and we drove around the Northern Beaches for most part. My 4 year-old daughter also fell in love with the car and has been asking me to get a similar car since! Thank you again for accommodating the pick up time and for making this great day possible. Anne. December 2015. We had a great time with Rocky. Simon. December 2015. Blanche was great and so was Tim. Please pass on our sincere thanks. A joy to drive and a true personality. Fond memories of the Smiths dials! Happy to recommend anytime. Will & Lindsay. December 2015. We had a wonderful time with Rocky, thank you very much. My partner was on cloud 9 all day and we had a great time driving up to the Hunter Valley. Lynda December 2015. Rocky was great….my husband used to love mustang. After riding it for some time he decided to buy his own soon! Manpreet. December 2015. Thanks – it went well. Had a lot of fun in Rocky. Philip December 2015. They absolutely loved the 1 hour Ferrari Joyride. My husband was so impressed and the kids were thrilled. I would definitely recommend this as a gift or experience. Danielle December 2015. I and my boys had a fantastic time and Mick was a great host. I recommend the 1 hour Mustang Joyride highly. Jeremy December 2015. Bessie and we did have a great day out. It was a great experience and certainly made my dads day. We went for a lovely drive and lunch by the river. Must say it was well worth seeing my dads reaction to his 70th surprise present he was very emotional and it brought back a lot of memories back from his early days when he use to own one. Only feedback is positive. Thanks again. Michelle. December 2015. We had a great time with Rocky. It was a gift for my husband and he enjoyed every moment of it! The whole experience was perfect from start to finish – thank you. Belinda December 2015. My husband really enjoyed the 3 days with Shelley. It was such a lovely car to drive and received a lot of attention on the roads. Thank you for assisting with this special experience, it was a winning gift choice! Robyn December 2015. Thanks for making our day, such a beautiful day. We will be sure to hire Penelope again one day. Maybe our anniversary! Owen and Kezia December 2015. Loretta and Lynn were great! Definitely was nice to show up to our ceremony in them and they were beautiful to drive. The boys were very happy too! Eleasha. November 2015. Bessie was a sensation! John and Alice returned from honeymoon today and John declared that Bessie was one of two highlights of the wedding for him. It has been declared the best wedding ever by a number of people and Bessie certainly had a major role to play – what a Grande Dame!!! Thank you. Jane November 2015. Angelika was beautiful. The car was a present for my partner’s birthday weekend. I’ve never driven an old car before so it was a different experience but a good one. Louise November 2015. We had a great day with Rocky, thanks very much for keeping him in such good condition and allowing us to play with him for the day. Great fun driving up to Leura for lunch and back…a real novelty. Has certainly inspired getting one like him….one day 😉 John November 2015. The day was fantastic. My missus said it was the best birthday present ever and she truly enjoyed taking Roger, her dream car, for a spin. Sean November 2015. Was fantastic. I was actually trying to work out ways of not returning Bertie and just keep driving. Loved it. Dean November 2015. It was a great experience! Chris was absolutely fabulous, super-helpful and very kind. And Bartholomew was an absolute dream. It was such a treat to have him for the weekend. Many thanks. Hilary November 2015. We had a superb day in Roger. Every minute was an adventure and met a lot of nice people who had either driven, owned, had a relative who had an A or some other reason for coming over to us and casting a longing eye over the 50 year old. Thoroughly enjoyed the day (even though it was about 35 in the shade) and will have no hesitation in recommending to any or all of my friends. Thank you for the opportunity. John November 2015. It was a wonderful day when we drove Roger to the winery. It was a special birthday for me and I have recommended it to alot of my friends. It is a wonderful menory we will treasure for ever. We felt that our day was planned so well and Roger drove like clockwork – no problems at all. Mary November 2015. We had a fabulous day. Best wedding anniversary by far! Penelope is a treasure. Jayne. November 2015. Our weekend with Raymundo was awesome! I loved the 70’s eccentricities of the car. Gauges,brakes and suspension. Everywhere we went he turned heads. Will definitely borrow him again. Thanks again for the opportunity. The ease of the organising was also appreciated as was Andrew’s passion for me to enjoy the car. Peter October 2015. Thank you for the opportunity to have a drive in a majestic vehicle. We had a fantastic day in Rocky. My husband loves Mustangs and the next time we decide to take a drive in a mustang, we will consider a longer time. Judy October 2015. My wife and I had the best time with Penelope. She was the perfect addition to our wedding day and made it that extra bit special. We didn’t have one single complaint or problem all weekend. Penelope has even persuaded my wife that we need a muscle car in our lives. So thank you! Andrew October 2015. Thanks for letting me use Rocky. It was a really fun time driving him around. Fanastic! Phil October 2015. We had a great time. The sun came out eventually and we enjoyed the cruise to over the Harbour Bridge, Vaucluse, Milsons Point, Circular Quay, The Rocks, Bondi, La Perouse, Brighton Le Sands and Cronulla. I was a bit nervous at first because Bertie is such a classic, but I soon relaxed and was changing gears smoothly! I’d love to take Bertie out again one day. Trish. October 2015. Rocky was excellent. A real fun experience and boy, we had the day for it! It was a great day out and I will be recommending it. Thanks so much. Karen October 2015. It was a loud and fun day. Hank’s engine/ exhaust sounded amazing and performed nicely. All in all it was a great experience, especially for the price and we enjoyed our day. Antony October 2015. Windsor was awesome!! We had a great day. We cruzed down through the National Park to Stanwell Tops, lunch at Scarborough Hotel & down to Austinmer. He was well behaved and was a pleasure to drive. Will be doing it again! Craig October 2015. We were very happy with Bertie Keith – and Peter was great, really helpful. Many thanks! Andy October 2015. We loved the trip away we had, and enjoyed the experience of taking Hank, a 66 Stang, with us. It was a father & son road trip for my son;s 13th birthday and he absolutely was thrilled. Pete October 2015. Just want to say what a pleasure it was driving Henry, the London cab. Jamie was courteous and enthusiastic and most helpful. I’ve always wanted to own a London taxi. Oh well, at least I got to drive one.We all had a lovely day. Thanks again 🙂 Isaac October 2015. Bertie was great, Peter was just lovely and my uncle had a wonderful time. 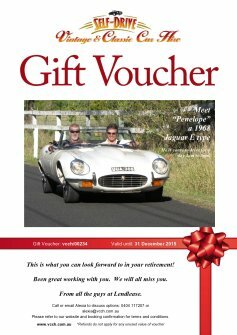 Will definitely be recommending your joyrides as a gift to other friends. Gabrielle October 2015. Had a great day with Windsor. Lunch at Scarborough, then down to Austinmer. Car was great! Thanks again. Craig October 2015. Had a fantastic time. Penelope was on her best behaviour. She has fulfulled a long held ambition without disappoitment. Many thanks. Bob & Roz October 2015. Mosey was great ! The girls had a ball arriving at the wedding – he made a grand entrance .Wes was fantastic upon pick up as well.Thanks. Ang September 2015. We loved our day out with Rocky. Many toots & lots of stares as we drove around. Even when we stopped we were approached for pictures. Felt like a celebrity. Samantha September 2015. All went well for us. We decided to take Windsor out to more local spots. So we had a run to Bundeena and Kurnell and lunch in the Royal National Park. Certainly attracts a lot of looks! Thanks so much for your assistance with it. Mark loved the experience. He still says it was a great gift for him; even though he only has a limited knowledge of cars, he’s always loved Mustangs! And we just loved the red colour too! Thanks again and best wishes to you and to Mick – he was really lovely and a pleasure to deal with. Sue and Mark September 2015. We had a great day out and Bertie ran like a dream! I was taken back to my first car (a 1966 mini) which I have fond memories of. At St Albans all the travellers marvelled at Bertie (and probably thought Dave and myself were the least likely passengers!). We really enjoyed the day cruising around in a beautiful old car that was all about the drive and removed us from the rat race. It was exactly how driving should be! Thank you again for letting us take out your pride and joy for a spin, the pleasure was all ours!!! Melissa September 2015. Had a great drive in Rocky, your Mustang. For the age of the car, it drives well, took about half hour to get used to it, but after that all good. Had an awesome day, would like to do it again, it’ll tide me over until I finish saving to buy one…Andrew September 2015. We enjoyed our tripping around the Southern Highland in Bertie and he performed well. We did not push him and he rewarded us with a very pleasant weekend.He likes country roads, not so happy on motorways! Gary September 2015. Truly one of the best cars I have ever driven. Can’t wait to do it it again. Rocky is well tuned and handles like a dream. I really liked how it is geared so it’s not quick off the mark but gradually gets up to speed and once you are cruising on the highway it gives you further room to move. It reinforced my love of muscle cars. Thanks to you and Alexia. Brett September 2015. My father had a great day – I don’t think Bertie missed a beat. Michael September 2015. We had a great time in Bertie, really enjoyed ourselves, so much so we bought bought one! Hugh September 2015. Rocky was great to drive and we had a great time. Daniel August 2015. We had a great time with Loretta at the wedding. She appeared in a few photo shoots . We took her for a run with the roof down on Friday which was good. She did behave herself and didn’t let us down. Everyone liked her. The owners are great people and easy to deal with. We had a wonderful day out cruising in Rocky! He was amazing to drive and we got plenty of appreciative looks as we drove around 🙂 I would highy reccommend you and Rocky. You keep him in fantastic condition! Petra August 2015. My Dad had a great day in Bertie! It was a big success, so thank you very much. Michael August 2015. We had a fabulous day with Lucalia thanks. Surpassed Gregs expectations. Debra July 2015. Sven has been an exceptional driving machine during the time I could munch kilometres with him! I have enjoyed every single litre of petrol that his engine has burnt away, no regrets. I will definitely consider spending more time with him! Matthew. July 2015. Just wanted to say what a wonderful time we had with Rocky. My husband was speechless when he found out what the suprise was, and loved the attention as we drove around. We ended up driving to Palm Beach and having lunch at the Boathouse and then driving through Manly on the way back. Your daughter was lovely and very accommodating. Thanks again for helping my to create an unforgettable experience. Holly July 2015. We had a brilliant time and we hope Penelope enjoyed having her legs stretched! Just like you said, likes letting her hair down when she gets the chance. She had a few chances to do so on a couple of perfect roads we found in the Southern Highlands that were very under populated and smooth. We aim to do something similar again, when we can justify it, maybe the Hunter next time. To be honest we feel privileged to be able to drive Penelope. We hope you keep her going for many, many years to come. Julian July 2015. Thanks again for the hire. Had a great time!! Lots of fun and Rocky definitely got the heads turning – had to wipe some drool marks off bonnet! Phil June 2015. My husband and I had a wonderful day with Rocky. Thanks to Alexia for being so flexible and re-booking dates when there were previous weather issues. Lily June 2015. Everything went perfectly with Reggie– thanks very much. Ian was a brilliant driver as well, super helpful, friendly and really put us at ease. Greg June 2015. Thank you so much for giving us Rocky for the day. It was a great surprise from my partner and one I won’t forget. He was an absolute please to drive and there were no issues what so ever. I have never received so many compliments or thumbs up while driving my van that’s for sure! Thank you again, and fingers crossed we get to meet him one day for another drive. Tom June 2015. I just wanted to say thank you for allowing us to drive “Rocky” on the weekend. Tom had a great day driving him and I found a new enjoyment for the car. Once again thank you for all your help. Tara May 2105. Thanks for a lovely couple of days with Penelope!! We are totally in love with her! We could hardly tear ourselves away from her!!! She is SOOO much fun! Perfect thank you. Helen and Nick May 2015. My fiance and me had a blast of a time in Rocky and John’s Angelika. Especially the latter, taking off gracefully from the front of the pact after the red light, felt like Moses leading the Hebrews. Peter May 2015. Wayne had a ball with Rocky. Said it could not have been better. Brenda Apr 2015. Hank was excellent. James May 2015. Certainly did enjoy my turn with Penelope, thank you. We had a great time with her! Rod Apr 2015. We loved our day out with Bertie and had a fabulous drive along The Putty Road to the Hunter Valley. We will recommend this experience to others. Jane and Derek Apr 2015. Pia and I enjoyed driving Rocky, the Mustang in Sydney and up to the blue mountains. It was amazing because people truly like the beauty of the old cars and its nice driving a vintage car like this. So I was very happy about the whole experience. A very pleasant experience that I love to repeat the next time I’m in Sydney. Alex and Pia Apr 2015. Penelope was absolutely fantastic, Keith! What a treat! Loved every minute of it. She is one of the prettiest cars ever built. Thank you so much and hope to see you again soon. Vera Apr 2015. The whole experience was wonderful, everything went according to plan and it really was a pleasure driving Holly-Rose, I just wish I had it for longer. Loch Apr 2015. Penelope ran like a dream, she was a real head turner especially with Alison sitting in her, wearing her bridal gown! Ryan Apr 2015. Awesome day, my Dad was ecstatic, Rocky is the same model as what my dad used to race minus the hardtop. He hadn’t driven a Stang since he binned his at Lakeside. It was great fun and a 67 Mustang California is now on my toys to be purchased list. Jono Apr 2015. Penelope was fantastic. Scheming to rent a Mercedes next from you. We really enjoyed the whole experience. Thank you very much! Stephen Apr 2015. I am happy to say that we had a wonderful time with Roger the MGB. He behaved very well and there were no issues. He started first time every time. The car was in top condition and obviously well maintained. Janet Apr 2015. Absolutely loved our day with Angelika. Mary-Louise Apr 2015. What a great way to spend my 50th birthday! Cruising with the top down feeling the air flow between my hair – though, wish I had some! Driving Holly-Rose, I felt young again. What a great car. Very comfortable with heaps of style and plenty of power. When the time to came to bring her back, well I had a tear in my eyes. I didn’t want to let her go. Chris Mar 2015. Thank you for the amazing experience. We love both Rocky and Hank. Both cars ran very well. They also sounded great on the road. We had many admirers and will definitely recommend them to our friends and family. Amina Mar 2015. Deb and I really enjoyed our day with the E-Type and would do it again tomorrow. The weather was perfect and Penelope was on her best behaviour. Terry and Deb Mar 2015. Hank was fantastic, it was the perfect surprise to take my partner down the coast for the weekend to propose. The only problem I have now is that she wants one of her own! Thanks for helping make a perfect weekend. Hayden Mar 2015. We loved it! The day was a birthday gift for my husband as Rocky is his dream car. Karen and Glenn Mar 2015. Our experience with Vintage and Classic Car hire was an absolute pleasure – it’s not often in life you get offered the use of a red Ferrari for the day! Driving Sophia was a dream, gear changes with the close pedals made winding around coast roads such fun, listening to her engine roar behind us while people just stopped and stared! Our only regret is that we didn’t take her on the wide open road to feel her in her full glory…there’s always next time! Anna Mar 2015. We had the best day in Rocky, and it couldn’t have been a better surprise for Greg’s milestone birthday. The look on his face when he realised he’d be driving Rocky for the day was priceless. The old Pacific Highway was a great route to take too, and there were plenty of opportunities for Greg to put Rocky through his paces, and he performed beautifully, according to the driver. I just loved the experience of being in such a classic convertible, and Rocky certainly attracted a lot of admiring attention on our trip to Wollombi. Lisa and Greg Mar 2015. We had a wonderful day out with Bertie and he behaved himself very well!! He must have enjoyed being out in the sunshine for the day as much as we did. Thanks again for helping me surprise my husband, he thoroughly enjoyed his birthday. Natalie Feb 2015. We want to thank you for making our wedding day so special! Winnie and Dot were beautiful – the icing on the cake. We would recommend you to anyone. Jess and Dan Sept 2014. Had a great time and it was good to drive an old mustang – one off the bucket list. Sam Feb 2015. Rocky was a great sport! Had such an amazing time, loved the vintage feel inside the car and the looks from everyone we passed. The sun was out and the V8 roared. Thoroughly enjoyed ourselves. Linda Feb 2105. Reggie was a joy to drive on the day. Anthony Feb 2015. My wife and I had a great time in your Mustang. It was excellent fun and I’d certainly recommend it to anyone. Brad Feb 2015. Holly-Rose is a delight and she was so beautiful. What a beautiful car. Thank you. Ian Feb 2015. We loved taking Rocky out for a spin for the day! Was heaps of fun. Simone and Nathan Feb 2015. We really enjoyed our 2 days with Roger. We had a good drive around Sydney and enjoyed our lunch at Glenmore Heritage Golf club. Les Feb 2015. We had a ball in Hank as a family, it was great to see Dad enjoy himself for his 70th birthday, a 67 Mustang was always his dream car and for him to have it over the weekend was great. Dad particularly enjoyed Sunday driving around the Southern Highlands before we returned to Sydney Monday. Many thanks for a great service and yes its wonderful to have access to these lovely old cars and have them benefit from a good drive around. What a great business service you run. Scott Feb 2015. Hank was a pleasure to drive. Enjoyed our day out. Kane Jan 2015. Rocky is a hot ride! Simon Jan 2015. It was an amazing experience and we all had a blast. Thank you for letting me have Rocky for the day. He is a divine piece of machinery and once I got used to driving him, I was in my element. Your a super lucky person to have Rocky in your family. Hope lots more people get to experience the joy. Keep on cruising Rocky and Keith thank you to and Lexi for being so easy to deal with and flexible. It was the perfect gift from my family and I hope one day I will be back to hire Rocky again. Brooke Jan 2015. We had a great day. Rocky was great. Elio. Jan 2015. We had a great day with the Mustang. The car behaved beautifully, no problems at all. David Jan 2015. We had a great time – my husband absolutely loved driving Rocky and had nothing but good things to tell everyone. Rocky drove really well too so he was very well behaved. Thanks very much for the experience. Sandy Dec 2014. Roger was well behaved and there were no problems I noticed, nor issues with hood, handling, engine etc. I am sensitive to mechanical issues, steering, brakes etc. and didn’t detect anything amiss. Thanks for the loan. I had a great time and it brought back good memories. Mike Dec 2014. Loved driving Rocky again, our second time out together! We had a great time. The proper authentic experience. Here’s to next time. Mark Dec 2014. Rocky was a fabulous drive. Of course he got plenty of looks too with us two ladies in there! We got a lovely tan on the way up to the hunter valley and pulling into the winerys was divine with people asking where we got him from. Thank you so much for the wonderful experience! Steph & Jen Dec 2014. Reggie has real class. And both my (now) husband and father had a great time behind the wheel. Emily, Dec 2014. I felt like Steve Mcqueen for a day, so thanks to you again. Thomas Nov 2014. I certainly had a fantastic time! It was a great day and it was the first time I got to drive a convertible. It was a beautiful drive and I enjoyed it thoroughly, so much so that I was really keen on maybe purchasing an MGB Roadster for myself. Kavan Nov 2014. Thank you once again for playing a part in what was a very special day for us made that much more nostalgic by adding in Reggie. Jeremy Nov 2014. Roger was in great condition and an absolute joy to ride. Definitely lived up to the expectation. And the car owner was a pleasure to deal with. Navid Oct 2014. We felt like movie stars driving under the stars, bonnie and clyde. It really made the weekend special. I found it funny that people wait until their wedding day to do stuff like this, when in actual fact on that day it doesn’t really matter what your driving and things are so chaotic you cant even enjoy it. The owners were very trusting with their baby and also took the time to take us through all the ins-and-outs of the car. They were very kind to meet us at the airport at such short notice which we really appreciated on a long weekend!